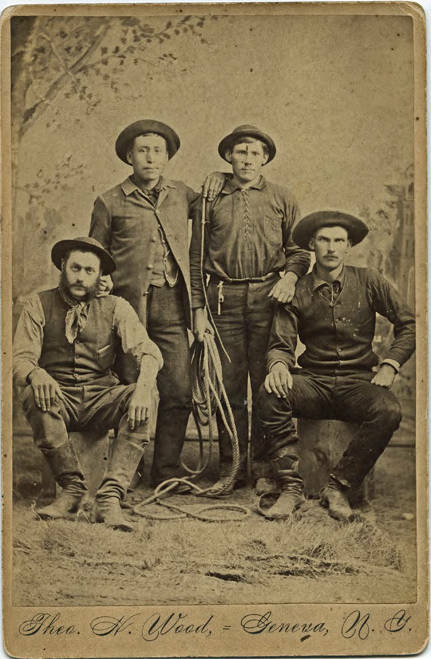 Sepia-toned photograph of four young men attired as cowboys. All wear boots and smaller brimmed hats; one has a rope and another has a riding crop. Two wear vests and all wear brimmed hats, though only one of those has the wider brim traditionally associated with cowboy hats. [Front] [stamped] Theo. H. Wood = Geneva, N. Y. [Back] [ink] Albert Tozier; Henry Sicade, Ben Martin, James Hopkins. Geneva, NY, 1886. These students at Pacific University were given a trip to New York the summer of 1886 by taking care of a car load of horses shipped W. D. Baxter. The horses from the bunch grass country near Yakima. [sic] These boys had the time of the their lives. [stamped] Theo. 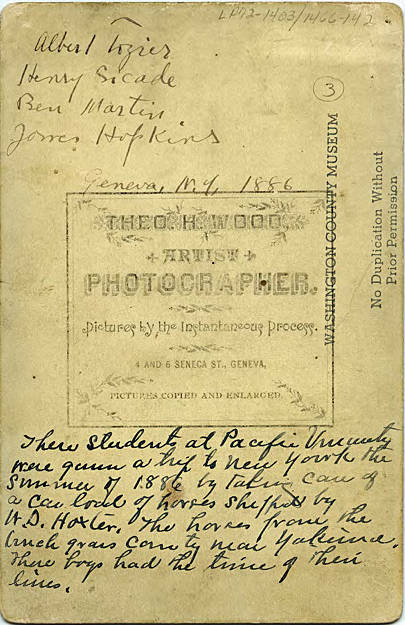 H. Wood, Artist, Photographer. Pictures by Instaneous Process. 4 and 6 Seneca St., Geneva. Pictures copies and enlarged.